Headquarted in Mumbai, India, SBI is the biggest bank in India. As of December 2013, it had assets of US $388 billion and 17,000 branches, including 190 foreign offices, making it the largest banking and financial services company in India by assets. 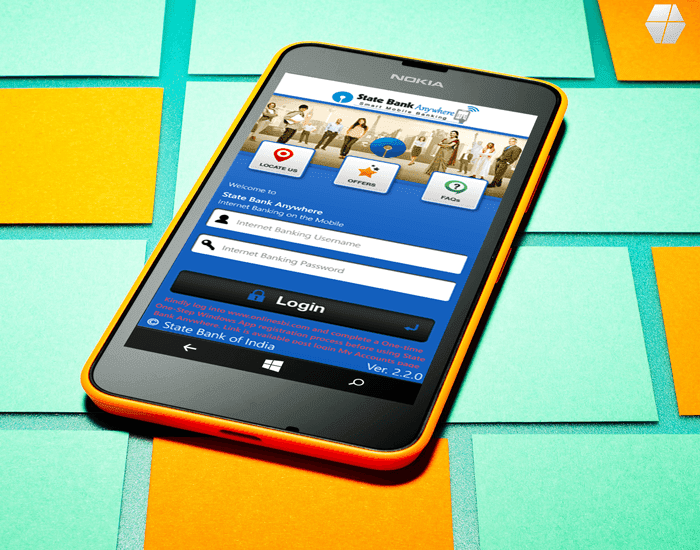 The bank has finally released an app for Windows Phone that makes banking much easier, State Bank Anywhere, is State Bank of India’s retail internet banking based application for your Windows smartphones. A safe, convenient and easy to use application with a host of features to help users manage your finances on the move. In order to activate the functionalies provided by the app, you need to log-in at WWW.ONLINESBI.COM AND COMPLETE A SIMPLE ONE-TIME ONE-STEP WINDOWS ACTIVATION BY CLICKING ON LINK “Windows App Registration” available on the left hand column on “Accounts Summary” page. One Time Registration process is required for login into State Bank Anywhere application for Windows devices. A smart phone with Windows Operating System (OS 8.0 or above). Existing SBI Retail (personal) Internet Banking username and password with Transaction Rights. Currently this app supports only State Bank of India Retail Internet Banking customers. Associate Banks’ internet banking users will not be able to use this app.